If you have watched any major sporting event in the past few years, chances are you have seen athletes wearing funny colored tape on their arms, legs, backs, and anywhere else they can stick it. Kinesiology tape comes in many names, colors, and packages and you may have questions about why they are wearing this tape all over themselves. This will be the first piece in a series of articles covering kinesiology tape, its applications, theories, and evidence. Let’ start with he basics. Kinesiology tape comes in many styles and packages, but it all functions the same way. It is an elastic, adhesive tape that can be worn for multiple days in a row and is water resistant. Since it is elastic, unlike right athletic tape, athletes find that kinesiology tape does not limit range of motion when it is applied over joints. This allows them to continue to train, play, and perform while wearing the tape. Athletic trainers, physical therapists, occupational therapists, and other healthcare practitioners use kinesiology tape to address many issues such as: pain, injury recovery, injury prevention, range of motion concerns, and to enhance performance. Clinical research suggests that kinesiology tape can effectively be used to decrease pain, increase circulation and improve lymph function, decrease inflammation, normalize muscle tone, improve movement and endurance while decreasing fatigue, and to inhibit or facilitate muscle recruitment or contraction. We’ll cover some of the clinical research later on in this article. With this research to support its use, kinesiology tape continues to grow in popularity and use. Athletes continue to wear it at sporting events, and now therapists are beginning to use it more regularly in outpatient PT/OT clinics. In many cases it has taken the place of traditional athletic tapes. To understand the rise of kinesiology tape in the athletic world, we must first understand how it differs from traditional athletic tapes. Before kinesiology tape was developed athletic trainers and therapists used athletic tapes to treat injuries and inability. This tape is rigid, provides support and stability, and restricts circulation when applied tightly over an area. This makes athletic tape useful when treating a sprained ankle or unstable joint, however one of the downsides of using rigid athletic tape is that it restricts range of motion. This leaves the athlete limited because of the lack of movement. Kinesiology tape, on the other hand, is an elastic tape. This allows it to provide support, improve range of motion, reduce pain, and increase circulation and lymph transport. Many athletes and trainers prefer kinesiology tape because it allows the joints to move in full ROM, as opposed to being restricted by traditional athletic taping. Many athletic trainers use kinesiology tape to improve an athlete’s performance by decreasing muscle fatigue, decreasing pain, improving strength, preventing injuries, and increasing fluid movement and lymphatic drainage. Let’s dive right into the fundamental theories of how kinesiology tape works and why it has become so popular among athletic trainers and therapists. We’ll go over the fundamental theories, then what the clinical evidence suggests. As stated before, kinesiology tape derives most of its popularity from the way it affects muscles, nerves, and motor groups. Below are the current theories that describe kinesiology tape’s affects on the body. The current theories on how kinesiology tape affects the body relate to its proprioceptive effects. 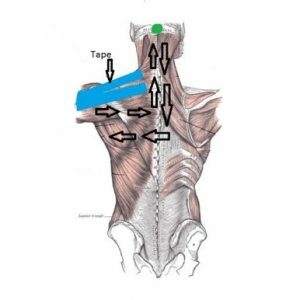 The theories state that kinesiology tape facilitates proprioceptive input from the muscle, skin, and joint by stimulating mechanoreceptors when tape is applied from proximal to distal due to the stretch recoil of the tape. The theories also state that kinesiology tape inhibits proprioceptive and nociceptive (pain) input when the tape is applied from distal to proximal. Reducing nociceptive input to the brain helps to normalize tone . The picture to the right demonstrates theory nicely. You can see that the tape, which is applied on the skin, creates sensory —or proprioceptive— input, which travels up the spinal cord and to the brain. The brain, in turn, up-regulates or down-regulates muscle groups, pain receptors, and normalizes muscle tone. It is also hypothesized that kinesiology tape improves the balance between muscle spindles when there is disequilibrium or imbalances. Some suggest that kinesiology tape also helps remodel facia and facilitate optimal joint alignment through neuromuscular feedback provided by the stretch of the tape . The last theory we will cover deals with the affects on kinesiology tape on the skin. Some evidence suggests that kinesiology tape helps reduce edema and facilitates healing by improving circulation and fluid movement to increase lymph transport. 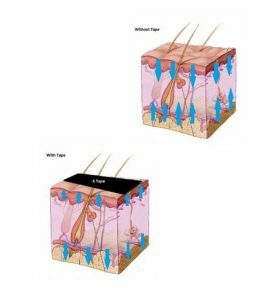 It does so by creating a “lift” or space in the dermal layers . All these theories and proposed affects means nothing if there is no evidence to support the claims. Luckily there have been many clinical studies completed on kinesiology tape and its various proposed uses and affects. I’ll highlight a few of the major findings and trends from the research literature, but feel free to go read the full articles (linked below). ROM: There may be a small beneficial effect on ROM in healthy individuals, however more research is needed. Strength: There is some evidence that K Tape has a beneficial effect on strength. Proprioception: Mixed results show need for further research. Overall: KT may have beneficial effects, but more research with better methods is required. What does this mean and how should it affect the way that therapists and healthcare professionals use kinesiology tape in practice? These findings suggest that kinesiology tape may have a role to play when treating pain, weakness, range of motion (ROM) limitations, and proprioception. Using kinesiology tape to affect muscle activity seems to be supported by the evidence as well. This could include using the tape to facilitate appropriate muscle recruitment or postural alignment. In the next part of this series, we’ll cover how to document the use of kinesiology tape in practice. observing two trial groups. One group received standard physiotherapy after having surgery to the lower extremities. The second group received standard physiotherapy in conjunction with kinesiology taping. To quote the study, “The application of kinesiology taping in the study group produced a significantly faster reduction of the edema compared to standard lymphatic drainage.” . This may be an area to explore further if you happen to treat post-surgical patients, or patients who experience edema. All of this suggests that kinesiology tape may be a good tool to keep in your clinical toolbox. Many patients or clients may even come in requesting it, since it has become rather popular in the mainstream sporting events as of late. Clinical research supports the use of kinesiology tape, especially when treating pain. If you’d like to learn more, grow your clinical skills and expertise, and become an expert who can easily answer the tough questions, head over to our resources page and check out what we’ve got to help you reach your professional and clinical goals. Do you use kinesiology tape in your clinic or practice? What has your experience with it been? Tell us in the comments below!